It was standing room only at Loveless Barn in Nashville Wednesday night, as the International Bluegrass Music Association (IBMA) celebrated its 25th anniversary with music from the full spectrum of bluegrass artists. Reaching back into its historic past with Jesse McReynolds and Rodney Dillard, and forward to its future in the likes of Sierra Hull and Rockin' Acoustic Circus, IBMA presented a showcase of talent that demonstrates why bluegrass is one of the most interesting genres of music today. Alison Brown, who opened the show, says diversity is a good thing when it comes to the music. "It is exciting to see all the talent here tonight and to hear the various forms our music is taking," she told the audience. 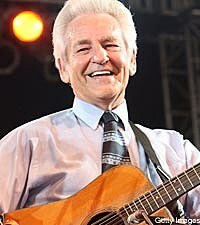 Allison brought out the first surprise guest for the evening, Del McCoury. "My band is scattered all over the United States right now, so I'm on my own," Del shared. "I think I'll do a little 'High on the Mountain' for you." The Farewell Drifters, who hail from Nashville, represented one of the younger sets of musicians, as did Sierra Hull and Rockin' Acoustic Circus. Sierra is currently attending Berklee School of Music in Boston, but took time to come and be part of the IBMA celebration. Rockin' Acoustic Circus, who hail from Oklahoma, is a six-piece from Oklahoma that features fiddle, mandolin, bass, banjo, guitar and cello. The unique configuration allows them to present some interesting new music for today's bluegrass sound. G2 is a group of young men, all sons of famous bluegrass musicians in Holland. Yes, Holland. The crowd showed their appreciation not only for the distance they traveled to be part of the show, but for their excellent skills as pickers. "We are so excited to be a part of this celebration," said Christoffer Olsson, lead singer and songwriter for the band, which will tour the US for four months. "We have found everyone to be so welcoming and friendly here." That observation includes their first encounter with a US policeman who stopped them as they were speeding toward one of their first gigs in the States. "We have watched American movies, so we were a little apprehensive about being stopped," Christoffer explained to the audience. Not to worry ... once the officer of the law understood they were a bluegrass band, not a brass band, he was more than happy to chat with them about his favorite music. "We gave him a copy of our album and he said, 'Boys I'm not gonna give y'all a ticket. You have a safe trip'," Christoffer relayed the happy ending to the story. Jesse has played bluegrass music for 63 years, 55 of those with his late brother, Jim McReynolds. He continues to be an innovator in the genre as witnessed by his announcement that he has a new album coming out titled 'Jesse McReynolds Plays Songs of the Grateful Dead.' "I decided to do this project after I found out Jerry Garcia was a fan of Jim & Jesse," the picker explained. "People are always surprised that I like all kinds of music." The evening closed out with two other traditionalists, Rodney Dillard and The Whites. Rodney, as part of The Dillards, had a re-occurring role on 'The Andy Griffith Show' for many years portraying a band called The Darlings. "How many of you watched that show?" he asked before just about everyone in the crowd responded with a 'yes.' Saying he was proud to be able to announce he had a new record label, Rodney performed three of the songs that The Darlings played throughout their television appearances. After singing 'Old Home Place' and 'There is a Time,' Rodney introduced 'Dooley' by saying, "This is a true story, but I guess you folks in Tennessee won't know a thing about it because you're all good people and you wouldn't know about moonshine!" He said all of the songs will be on his new album, 'I Wish Life Was Like Mayberry,' due out in September. "This has been a wonderful crowd and a great opportunity to play on the same stage with such wonderful musicians," Sharon said. "We're all like kinfolks up tonight." During pre-show activities, the IBMA honored the men and women who had come together in Nashville 25 years ago to form the trade organization. The group has been responsible for introducing a number of programs into the music community, including the International Bluegrass Music Awards, the Bluegrass Hall of Fame, the Bluegrass Trust Fund, the International Bluegrass Music Museum in Owensboro, Ky., the Foundation for Bluegrass Music and the Bluegrass Music in the Schools program. IBMA's World of Bluegrass, the music genre's business convention and Fan Fest, is scheduled for September 27 through October 3 in Nashville. The three-day Bluegrass Fan Fest, October 1-3, will include more than 60 bands in the genre on three stages, an exhibit hall, workshops and other activities for fans at the Nashville Convention Center.